Orleans Darkwa delivers a rushing touchdown for the Giants. 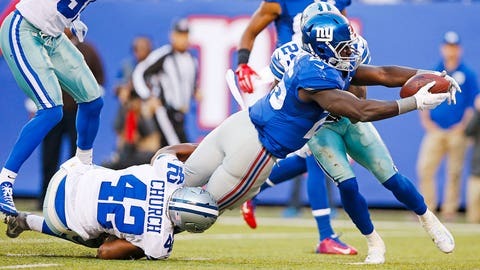 The fourth player on the New York Giants’ depth chart at running back delivered the first rushing touchdown for the team since Week 3 when Orleans Darkwa exploded through the middle of the defense for a 15-yard touchdown run in the team’s Week 7 matchup against the Dallas Cowboys. Darkwa has not seen many offensive snaps in 2015, but his playing time could increase going forward if the Giants’ top three backs continue to struggle. He finished the Giants’ Week 7 27-20 win over the Cowboys with 48 rushing yards on a team-high eight carries.